I shot down a frakkin' HELICOPTER. With an ARROW. Recently deceased. Rolf Soren Ramis was a champion archer in Austria when he was a young teen, winning many contests and being a serious contender for the Austrian Metalympic archery team when he became 18. His father was an inventor who was creating a new form of sim-rigging, and was bought out by Ares when Rolf was only 17. Rolf was invited to take part in a special exhibition team run by Ares to showcase their new products. Rolf was very excited about the opportunity, and considered it the perfect training tool for one day competing in the Metalympics. He also was fascinated by the corporate structure of Ares, considering that his father’s business was fairly large, and was only a drop in the bucket of the megacorp. After a period of training and some significant bio and cyberware additions, young Rolf was undergoing the final stage in the process. It was a “welcome aboard” simstim reinforcing brand loyalty and the Ares mission statement that was created using Herr Ramis’ technology. It was a tech demo of sorts, being shown to some serious corporate honchos. Tragedy struck, however, as Rolf’s mind was completely shattered by the process. He quickly grabbed his bow and killed two execs before the guards had time to react. The fallout from the event led to the “termination” of Rolf’s father, and Rolf himself was slated to be executed, as well. Fortunately, it would appear that he had someone watching out for him (Rolf would consider it to be the personal blessing and protection of Damien Knight himself) as he was secreted away from the overall corporate structure, and the project completely dismantled and covered up. Rolf is now a knight-errant of sorts (at least he likes to think of himself that way, as KE is a popular Ares subsidiary), questing on behalf of Ares. His savior now gives him access to dikoted arrows and other equipment to move in the megacorps’ best interests. The corp thinks he’s dead, but rumors abound of a Robin Hood-like individual, stalking the night and proclaiming the might and virtues of the Ares corporation. Of course, his handler probably simply has personal gain in mind, but Rolf is so easily manipulated that he wouldn’t believe that if he had actual proof of it. He’s a zealous one. The past several months have been eye-opening to Rolf. Tagging along with the group, he’s learned a valuable lesson in life. True happiness does not come solely from praising the good works of Ares. Metaman cannot live on nutrisoy alone (well, technically most folks can last up to 2 years before massive kidney failure kicks in, but that’s hardly the point). And while Rolf has had his spiritual needs being met by relishing the great works of Damien Knight (blessings and profits be upon him), he’s found a new lease on life in shadowrunning. 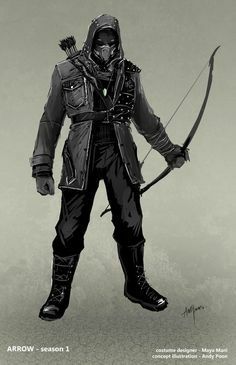 His passion for the bow has expanded to be a part of a greater whole, and that greater whole is sometimes shooting people right in the face for money. Though it’s not about the money any longer for Rolf. Growing up rich, that was never the great brass ring to Rolf that it may be for others. No, this is about finding one’s place in the world. And that place, for Rolf, is the type of place where one leaps out of perfectly good 57th-story windows, or swings by grappling hook from one space pod to another risking getting sliced in two by a monofilament wire. Maybe part of it has to do with the fact that he now finally gets the opportunity to be around people that are as insane as he is. Maybe it’s the camaraderie that can only come from narrowly cheating death with a group that you trust. Maybe it’s just how incredibly awesome it is that he’s gotten to punch people in the head so hard that they mostly have come off. Whatever it is, Rolf and Otto (his AR dog, who apparently only Rolf can see and no one is entirely sure exists) are in it for the long haul. Of course, it was probably pretty bad timing for Rolf to have his little revelation, because after a quick cosmetic surgery and fake SIN swapout, it’s been lay-low time for the past several weeks. Rolf toyed with the idea of doing something drastic with his surgery, such as gender or metatype reassignment, but he decided that it would probably just cause more problems than it would be worth, and probably not something best done on a whim anyway. Impersonating a Suomi Finn, on the other hand, that’s something he’d be just crazy enough to do. So he’s been going by the name of Jussi Haapalainen. He thinks it’s really, really funny for some reason, and before the surgery he laughingly asked the doc, somewhat perplexingly, to make him look “as Suomi as possible”. It must be an Austrian thing. Unfortunately, impersonating a Finn doesn’t earn much by the way of nuyen, so he’s been getting his kicks in an underground fighting ring in Vory territory, going by the street name of “LaserWolf” and wisely leaving his comms firmly off when he’s anywhere near the neighborhoods that have the fights. No comms, no SINs, he figures. Everyone uses street names down there, so he might as well go along with it. Besides, LaserWolf is really cool and badass-sounding. There are many layers of irony in that name. He’s had too damn much time to think about it. God, he misses real shadowrunning.